The ceremony and all the stress and nervousness are over. It’s now time to celebrate the wonderful occasion at the wedding reception. Friends and family are all gathered for a wonderful time of celebration that often includes dining, dancing, and well-wishes to the bride & groom in the form of toasts. 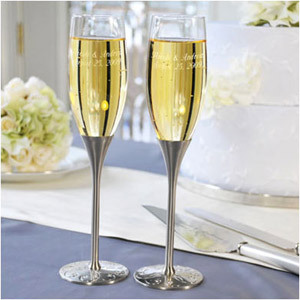 Toasts to the bride & groom can occur anytime during the reception which may vary by region, but they are most often done after dinner and sometimes coincide with the time dedicated to the cake-cutting or the serving of dessert. How many people give toasts will vary, but they should always start with the host of the event. Additional toasts by family and friends can then follow. Here are a few tips on etiquette to make wedding day toasts a success. Tip #1: Practice & Rehearse: You don’t have to memorize your toast, but it is good to have established a guideline that you will follow. This will also provide you confidence for your delivery. Tip #2: Keep it short: Remember that no matter how much you want to share about the last 20 years you’ve known the bride and/or groom, your audience has a short attention span. Also, there are possibly additional toasts coming after yours, so be polite and keep your timing to just a few minutes. Tip #3: Keep it tactful: We know you have the “best” story about the bride or groom that you’re just itching to tell to hundreds of people, but remember this is a day to celebrate their marriage. You may also be speaking to an audience who may not appreciate your potentially embarrassing story like you do, so select your stories carefully. Tip #4: Receiving at toast: Have you ever wondered if you should clap for yourself when someone is applauding you? Well, the answer to that is “no”. The same applies with a toast. While receiving a toast, you should simply receive it and not participate by raising your glass or drinking. Tip #5: Participate: Toasting does not require that the beverage be alcoholic, so if you do not drink alcohol do not worry. You can raise an empty glass or one containing your drink of preference. Tip #6: Notification: If there are preselected people who you would like to give toasts at an event, please let them know so they can prepare. Nothing spells stress like putting someone on the spot and expecting them to immediately speak like a poet. Be kind. Let them know ahead of time.